Hi! My name is Mira, and I have been a Heartware Network staff for close to 4 years (my first job since graduating from Uni!). Even before we shifted to our current office at Ganges Avenue, we receive high volumes of volunteers especially in our training phase – that’s around this part of the year. But because so few are allowed to enter the main areas of where staff work, it is a wonder what happens behind those closed glass doors. Well, those walls are torn down today. Share Your Vision and Mission, Recruit! Everyday when we step into the office at 9am, we dive into work that needs attention. 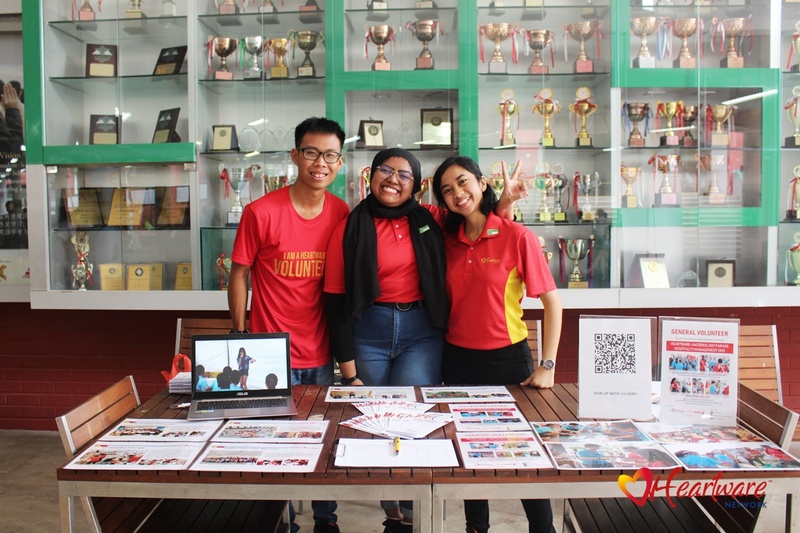 But sometimes, you can find us at schools instead reaching out to students and sharing our cause and meaningful programmes. We do this mostly either through recruitment booths or talks. 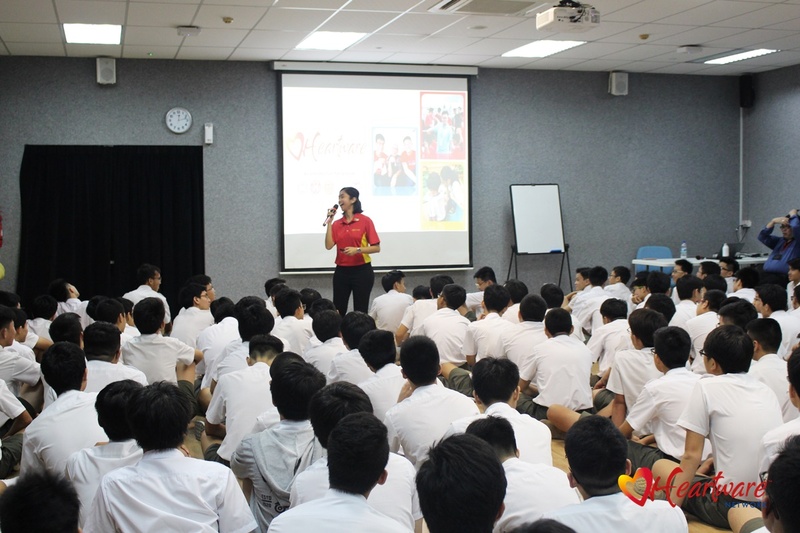 Click here to check out our school visitations this April! Volunteer facilitator Loynes, Heartware – President’s Challenge Staff IC Aini, and I were clearly pleased with how clean and pleasant our recruitment booth was arranged. 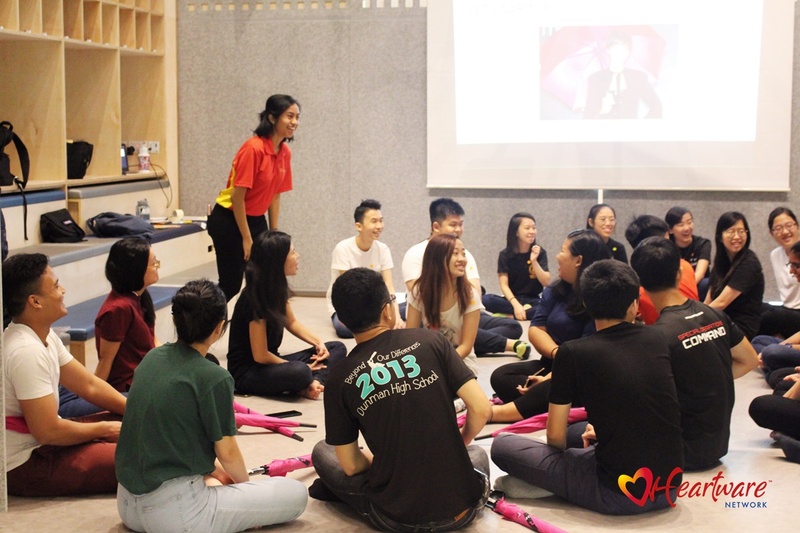 If I were ever to be caught singing at a recruitment talk, then it was to sing praises over the good deeds of our volunteers in all our programmes. 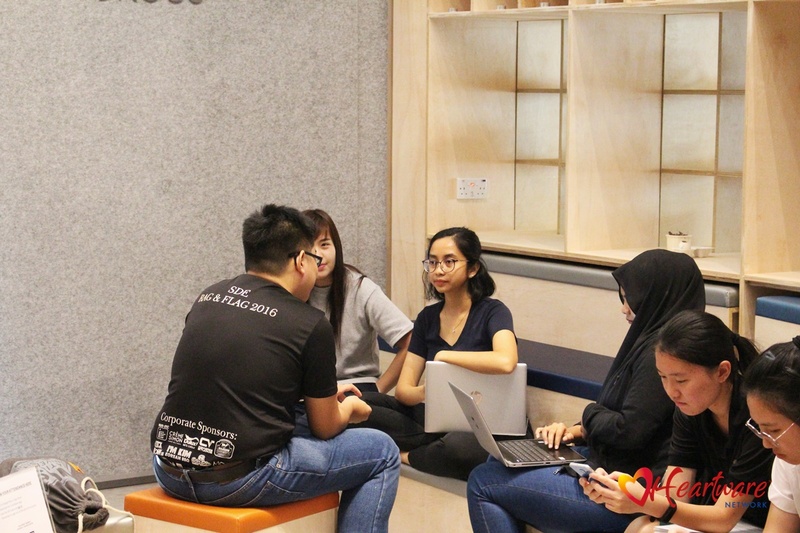 Talks are nerve-wrecking because it is challenging to appear engaging in front of students who can be distracted or refuse to see the relevance of volunteerism in their lives. It gets better with practice. 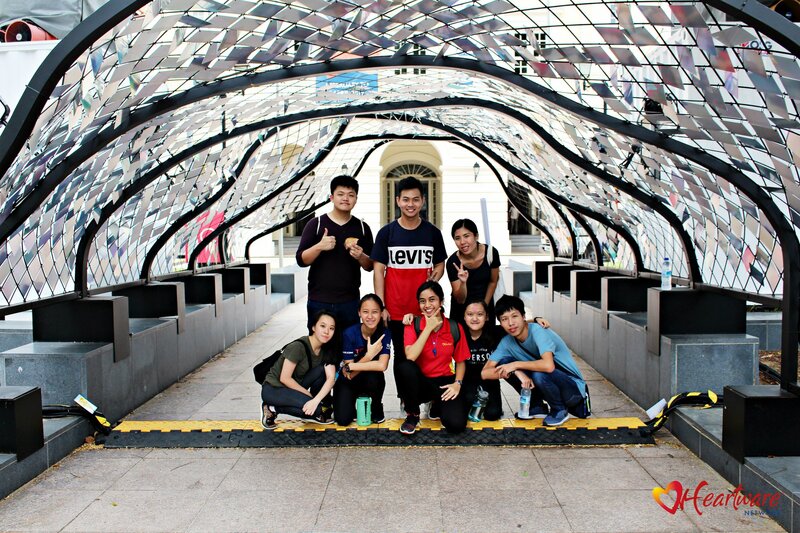 A huge responsibility of a project staff is volunteer management. This includes writing up factsheets, designing EDMs, opening recruitment, publicising recruitment materials strategically, tracking numbers, interviewing participants, on-boarding volunteers, monitoring deployments, chairing meetings, checking in with many stakeholders, ensuring hours are recorded and awarded. Sounds like huge deal? But I haven’t gotten to the messy part of people management? Imagine handling disgruntled volunteers who cannot be awarded due to poor attendance, or managing baseless rumours being spread that can damage the reputation of a volunteer, staff, or programme. Think you can handle it? If yes, please send in your CV to admin@heartware-network.org. Interviewing a media volunteer (yes, I head the publicity side of the organisation too!). To reach this stage, even interview questions and rubrics must be carefully thought out so that we can select the right youths for the programme. 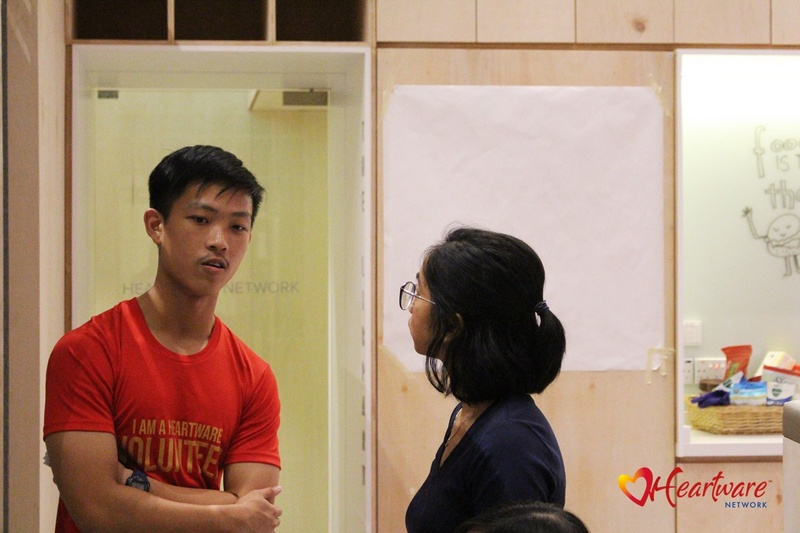 Checked in with volunteer facilitator Si En in the middle of the Heartware Tuition Programme deployment training, to understand how he thought the session could be improved. One of the best things (in my opinion) to have come out in recent years is the setting up of the Heartware Academy, that becomes the training and curriculum development branch of Heartware. Piloting this new addition to the organisation made my heart sing! Oh, to put what I learnt as a Psychology major in the writing of curriculum specific to our volunteers and students under the Heartware – Character and Citizenship Education Leadership Programme, which has been under my care from 2016. Our volunteers should always be sufficiently ready to take on their volunteering engagements and community service learning projects. Playing the main facilitator / trainer to our new group of volunteer facilitators. Need to be a role model. No pressure at all. Training sessions are heck fun, especially when we do it outdoors. I love having a say on how we run our training sessions!!! If you are a volunteer coming by our office, maybe you will see our staff and interns kicking a football around, chit-chatting leisurely, exchanging jokes and sarcastic remarks, and bursting into laughter uninhibitedly. That’s because the best working environment for us is to be free and stay authentic to our personalities, and accept one another sincerely. Whether there is a volunteer there or not, you can count on me to still appear sticky around my fellow colleagues. 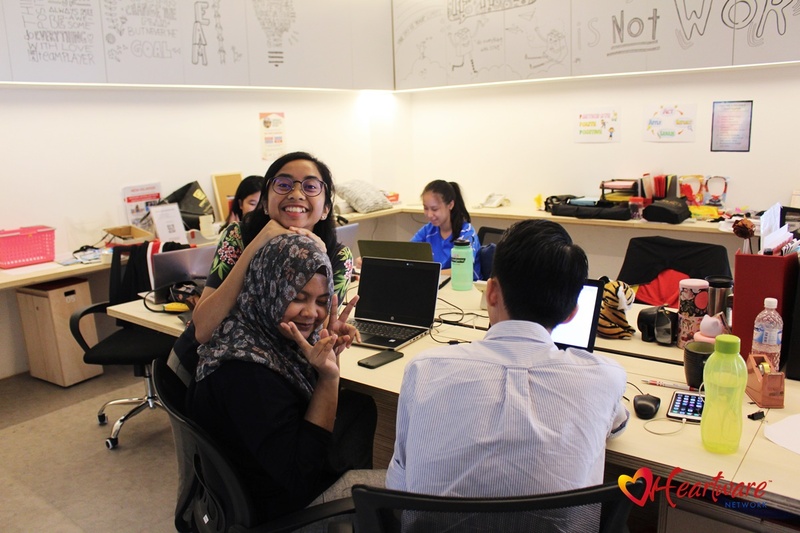 Though there are not many volunteers under my care compared to other project staff and am therefore not as visible, I am probably notorious for playing around in the office. Maybe a bit too much. But being playful helps me jog my mind for work that demands creativity! I found someone who can spar with my child-like side. I have been playing too much since. Somebody please send help. In the end, this is the sight you can often find me in. I spend most of my time now at my desk (other than when called for meetings) conceptualising everything that has to be executed above. For one 4-hour training session that a volunteer receives, the planning begins about 2 months beforehand and needs collaboration from relevant project staff, opinions from directors, and coordination of facilitators. For one instagram post to be released, it takes a comprehensive timeline planned out months before, delegating work to media volunteers, and vetting several rounds of submissions on the same material before it’s ready to be seen. The hard work is worth it as much as it is hectic. Just like how a volunteer feels immense satisfaction having served the beneficiaries well, my rewards come when volunteers share how much growth they have gained from the programmes we have worked so hard to lay out. In the end, that’s enough for me to keep going. So next time you see a Heartware staff, show us your love! We’re on a learning journey too, and we will continue to work hard in elevating the programmes you and I love so dearly.